1. 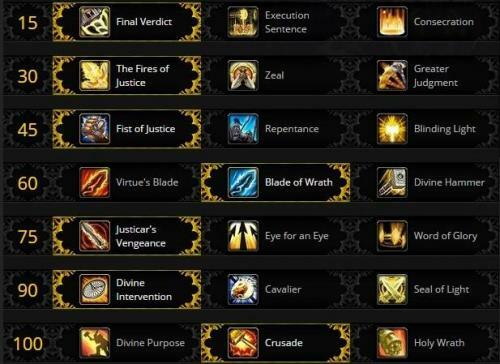 Using Fight Class Editor, I can not get the proc "The Fires of Justice" or "Divine Purpose" to work at all. I have tried with Buff names, and C code "ObjectManager.Me.HaveBuff(209785)", still the rotation does not use these procs, massive dps loss. 2. Most of the C# code i download from here does not run, unless its converted from xml, i get the error "Compilation error: warning CS1685: The predefined type 'System.Runtime.CompilerServices.ExtensionAttribute' is defined in multiple assemblies in the global alais; using definition from 'c:\windows\microsoft.net\framework\v4.0.30319\mscorlib.dll' error CS0246: The type namespace name 'CombatRoutine' could not be found" 3. is WRobot compatible with C#, LUA, and xml? I have several routines from other bots with LUA code, can these just run? or need adjustments? I make my own routines, as most of the ones i found here for Ret paladin just spam every cooldown incorrectly, I am a mythic raider and currently building my own rotation. What is the minimum for C# code, that i need to build my own rotation? It seems that the Fight Class Editor is only for basic routines, and not as strong as C# code. 4. 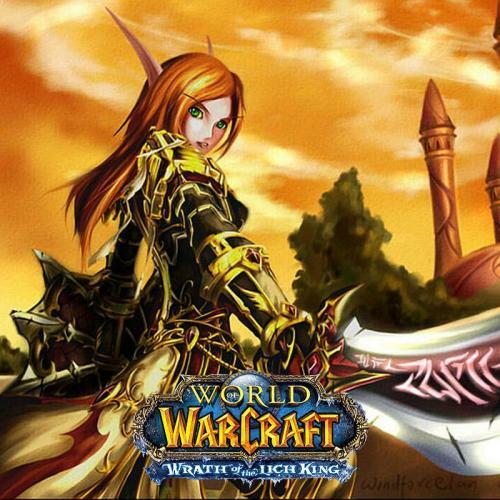 AoE sometimes works, sometimes doesnt, depends on what type enemies are near my toon. In Fight Class Editor, i'm using Condition: Unit Attack Player Near - number '1' / radius '10' / type 'bigger'. Sometimes this uses aoe abilities with 2+ mobs, sometimes doesn't. is this the right aoe condition to use? Thank you for all that help answer my questions. 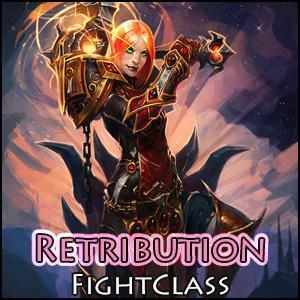 Fight class I made for personal use to level my paladin from 85-90 Talents Used: 15: Long Arm of the Law 30: Fist of Justice 45: Selfless Healer 60: Clemency 75: Sanctified Wrath This fight class does several things: Against any number of attackers, this fight class casts Avenging Wrath and Guardian of Ancient Kings on cooldown. Defensively, under 80% HP, flash of light is cast (typically with 1-2 stacks of Selfless Healer) to bring the paladin back to full. Additionally, at 35% HP, Divine Protection is cast, and if the paladin gets to 20% HP, Lay on Hands will be cast. Versus 1-2 mobs, it performs a normal FCFS (first come, first serve) rotation, using Crusader Strike, Judgement, and Exorcism to build holy power then using Templar's Verdict to dump holy power. 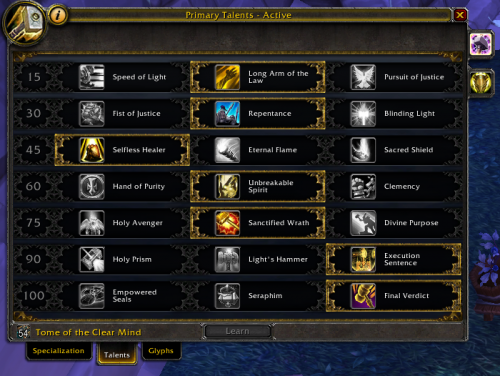 Versus 3+ mobs, this fight class uses Hammer of the Righteous to build holy power, and Divine Storm to dump holy power. [*]In any situation, this fight class keeps Inquisition (30% increase to holy damage, 10% crit increase) up 100% of the time, while also casting Blessing of Kings every 60 minutes on the dot. [*]Against a mob that is spellcasting, Rebuke is immediately used to interrupt the cast. If Rebuke is on cooldown, this profile attempts to use Fist of Justice to stun the target, and interrupt spellcasting with the stun. 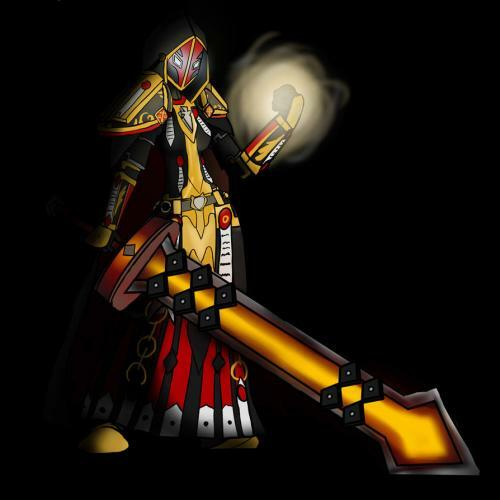 This profile is NOT recommended for level 90 at this point, due to the fact that I'm still in the leveling process from 85-90 on my paladin, and have not included a level 90 talent in the rotation, however, it can certainly be used for grinding purposes, and would be suitable as a fight class on a gathering toon.